require root SSH access to the remote server. Instead, you’ll be able to connect using the account’s login information. While this does come in handy when you can’t obtain root access, this method will only work when transferring from a cPanel/WHM server, unfortunately. If you’re transferring an account from some other control panel, you’ll have to use the transfer feature requiring root SSH access. As of cPanel 11.24.1, this tool has been much improved over the one in previous versions; it is now much more reliable. We don’t recommend you use this tool if you have a prior version of cPanel. 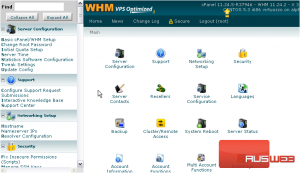 Instead, you should log into the remote cPanel account, take a full backup, and restore it on the destination server. You’ll see how to do that in the Management series. 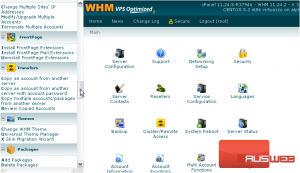 Remember — you can always check a cPanel server’s version by logging into WHM and looking up here. 1) Now, let’s get started. Go to the Transfers menu. 2) Click Copy an account from another server with account password. At the top of this page, you’ll see some usage notes. We’ve already gone over most of these. All you have to do to transfer an account this way is enter the details in this short form. 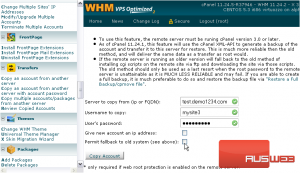 3) First, enter the hostname or IP address of the remote server. 4) A domain name shouldn’t be needed, but it can’t hurt to fill in one anyway. Put the main domain of the account. 5) Then, provide the account’s username. 6) And, then, the user’s password. 7) Give the transferred account a dedicated IP address with this checkbox, if you want. We recommend you disable this option. Instead of falling back to the old transfer system, use a full backup as we mentioned earlier. 8) All that’s left is to start the transfer. Hit the Copy Account button. 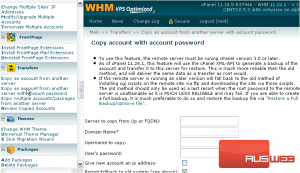 First, this tool will create and download a backup of the account from the remote server. Once it’s extracted locally, a new account will be generated. Success! The account has been transferred.